From left: Arburg subsidiary manager Marc Schuh, Marc Gendron, department manager services & partners and Maxime Dupont, development engineer from energy provider EDF Entreprises. This subsidy is part of an energy-saving campaign in France run by EDF and Arburg, based on the CEE energy saving certificate which aims to significantly reduce industrial energy consumption. The certificate, which is specially intended for electric or hybrid injection moulding machines, was introduced at the end of 2013. 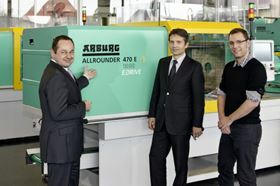 The subsidy is available for Arburg’s electric and hybrid Allrounder machines from the Alldrive, Edrive and Hidrive, which are suitable for for ceramic and metal injection moulding (CIM and MIM). EDF says it will subsidise customers with regard to their investments in energy-efficient electric and hybrid machines by up to 10% of the purchase price. "Through the cooperation with EDF Entreprises, we are promoting electric and hybrid machine technology, which consumes up to 50% less energy compared to hydraulic drives,” said Marc Schuh, managing director of Arburg France. The subsidy is available at least until 31 December 2014, provided the machine is deployed in France. IMM Projects plans to distribute Beston injection molding machines to the UK market for the first time. Metal injection molding specialist Arburg reports that its Indonesian subsidiary recently celebrated its 10th anniversary. PM China 2016, which took place in Shanghai in April, brought together over 360 exhibitors from all around the world.